In much the same way that I've never watched Supernatural, I've also never watched Dragon Ball Z. I tried giving it a chance, back when it was a brand new thing on Toonami, but it was just interminably boring - weeks would go by with no advancement in the story, episode after episode of people standing in place and yelling... it had no appeal. So I've never made another effort at it, and it remains a massive blindspot in my pop cultural knowledge (I once had to ask a friend who was into anime if it was pronounced "Ball-Zee" or "Ballz"). But toys of interesting character designs are toys of interesting character designs, so here we go! Beerus is... you know, I don't care. His wiki page is over 19,000 words, which is longer than Shakespeare's Macbeth - who's got time to spend reading that? [What's done cannot be undone. --ed.] Whether he's a space mutant or a demigod or a hallucination brought on by eating an old Papa John's pizza found in the gutter where it belongs, he's going to have the same role in the story: he's going to threaten something or someone, Goku is going to challenge him to a fight, he's going to be too strong, so Goku is going to have to train or otherwise learn/develop a new power to face him. Tell me I'm wrong, weebs! One thing I do know about DBZ? Half the characters have joke names. The guy who came up with the story for the movie that introduced Beerus named him ビルス (Birusu) as a pun on "virus," but creator Akira Toriyama thought it was a pun on beer, so everyone related to him gets alcohol-based names: his attendant Whis, his brother Champa, and his brother's attendant Vados. Birusu was originally going to be some sort of lizard-like creature, but Toriyama changed that, too: now Beerus was based on the Cornish Rex he owned at the time; it had gotten sick and was expected to die, but made a recovery, leading the vet to joke that the cat was a demon. Despite that, Beerus' bulging eyes and tall ears make him look more like a Sphynx cat than a Cornish Rex. Of course, part of that may be his pseudo-Egyptian garb. Beerus is thin and muscular, but he wears poofy blue pants with a sash belt and a long, pointed loincloth. Draped over his shoulders is a shawl reminiscent of the broad wesekh collar familar from ancient Egyptian art. The loincloth and collar have geometric patterns on them. He also wears booties and a few piece of golden jewelry: anklets, bracelets, bands on the upper arms, a choker, and a single earring in his left ear. Actually accommodating the fact that he's an animal, his pants scoop low in the back so his tail can poke through. Bandai, in America, has a reputation for not doing very well with collector-oriented lines. 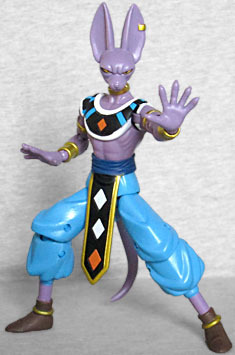 This Beerus was released in the Dragon Stars Series, a collector-oriented line. Guess where this is going. Well, you guessed wrong: this figure is great! What are the major complaints with Bandai toys? They're glossy, they have visible screw-holes, and the articulation is crap. Well, Beerus isn't any glossier than a Marvel Legends or DC Multiverse figure, he's assembled seamlessly, and the articulation... oh, the articulation! Beerus has a balljointed head, swivel/hinge shoulders, double-hinged elbows, swivel/hinge wrists, balljointed hands, a balljointed waist, balljointed hips, swivel thighs, double-hinged knees, balljointed ankles and a balljointed tail. Plus, a hinge in the hips like the DC Bombshells had, to facilitate better posing in the legs. Honestly, the only kind of joint missing is some sort of swivel in the biceps. He's plenty poseable and fun! The figure's only accessories are a second pair of hands: splayed fingers, rather than fists; that's why the hands are on balljoints, to make swapping them easy. There are other things they could have done - a hand holding chopsticks, for instance, or a big energy ball - but this is fine. He also comes with a Build-A-Figure piece, because ToyBiz really did change the industry when they started making those. Buy all six figures in the Dragon Stars Series, and you can build a Shenron. [The Schmartest Guys in the Room? --ed.] Beerus gets the neck and the clear plastic stand that will make the full dragon hover. 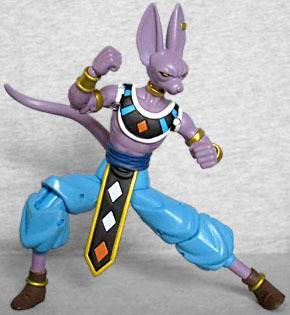 This is not the best Beerus figure available. There's also an SH Figuarts version that has more articulation, more alternate hands, and a few alternate faces. But that doesn't have a BAF, and costs more than twice as much as this release. Plus, you can find these Dragon Stars at Walgreens, of all places! So no, I may not know anything about the show or the character, but for $20, I'll happily add this to my collection as some kind of purple-skinned Egyptian cat-god.